For the past few years, I've vowed to take a camping trip in October. Yet it never happened. 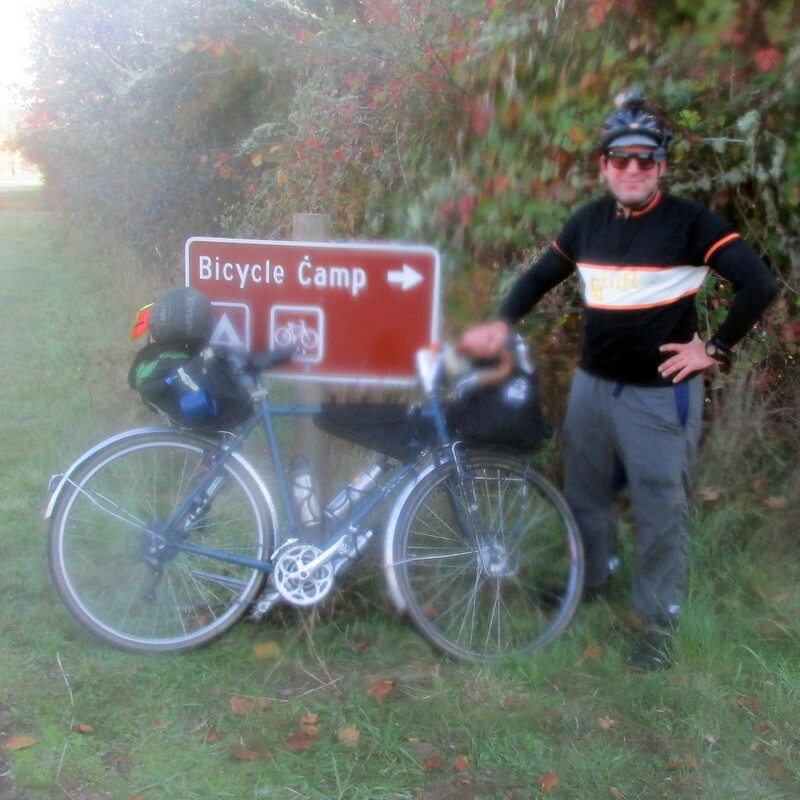 Either I get distracted, forgot about it, the weather turns crap, or in the case of October 2011, was too worn out and burnt on camping after four plus months of touring. This year, things are different. September was very wet and crappy around these parts, which meant that beside the San Juans tour I didn't do any bike camping that month. So I was more eager to camp in October than in the past. Add to that the "Indian Summer" weather we've been having: sunny, dry, highs in the 60s (F). Great weather for bike riding...and bike camping. 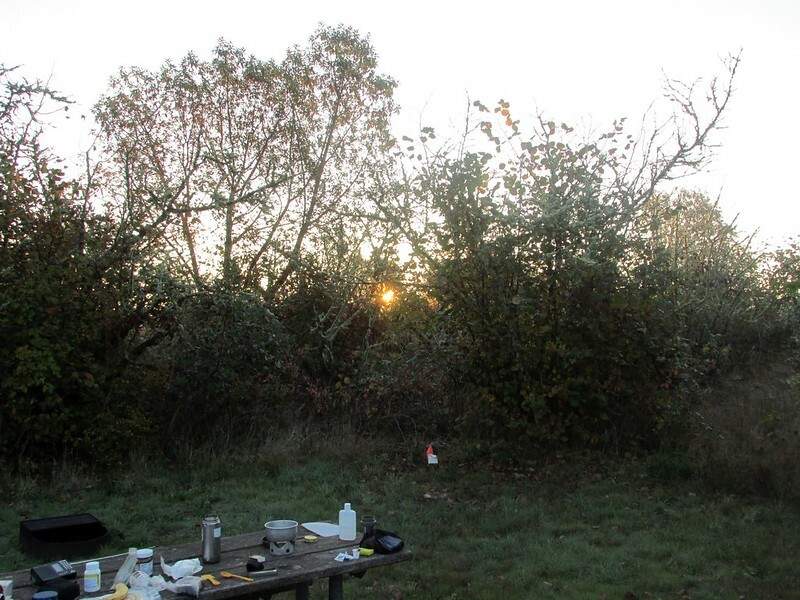 This past Tuesday and Wednesday, October 15 and 16, everything lined up right: I had two days off, the weather still great, and while I was still recovering from a cold and...another unrelated ailment, I felt well enough to go camp. Normally for a bike overnight this time of year, I might shoot for something a little less ambitious and closer to Portland, say 30 miles or so. (Short days don't encourage long rides.) 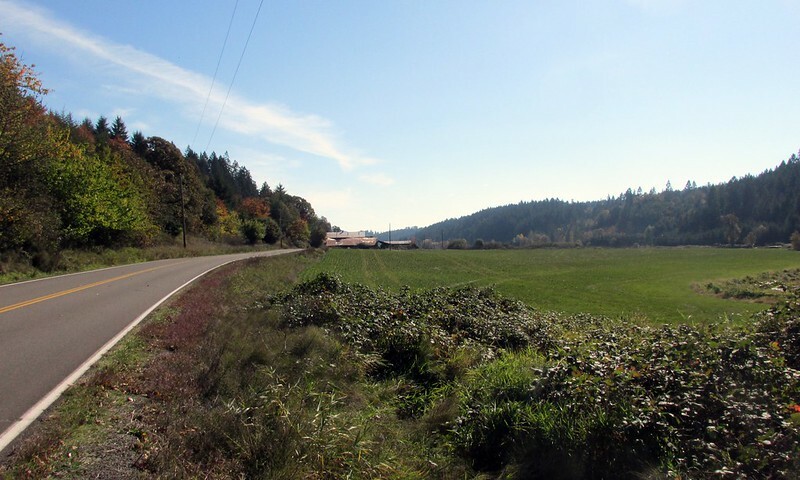 But I wanted something a bit more, and I wanted to test some routing options to the west of Portland starting in the suburbs that headed through wine country into the Willamette Valley. Y'see, next year I hope to conduct one or two Society of Three Speeds multi-day tours and this area seems like an appropriate area for it. (Thanks Rick for the suggestion!) So it's also a scouting mission on top of a ride to camp. 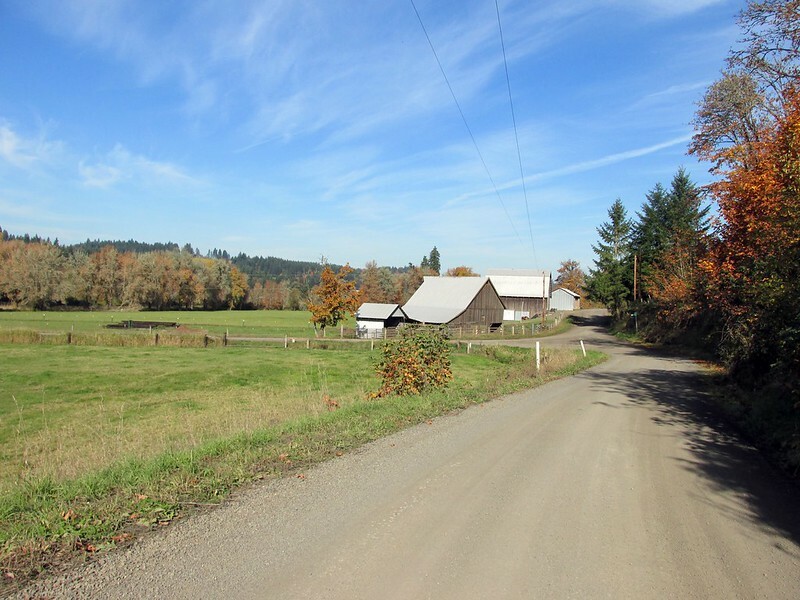 The destination for this trip was Willamette Mission State Park, about 15 miles north of Salem. Willamette Mission isn't the most obvious camping destination in this area (the obvious would be Champoeg, 15 miles northeast of Willamette Mission), as it's considered more of a day use park than a campground. But besides its group camp, it has a hiker/biker site! This is a pretty recent addition, and the only reason it's here is because the Willamette Valley Scenic Bikeway (WVSB) passes right by it. * I have camped at Champoeg a few times, find that it's ehhh, so I wanted to give a different park a shot. 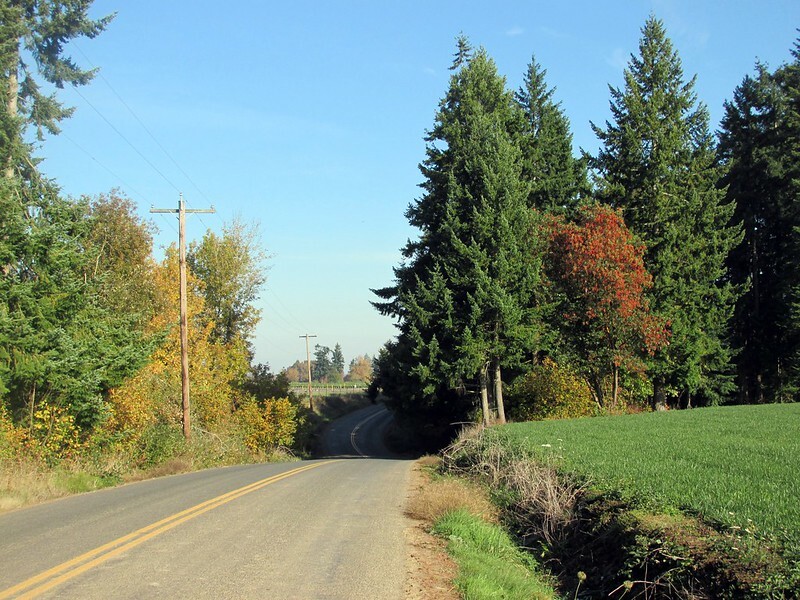 On Tuesday morning I got a later start than I anticipated, so I didn't arrive into the west side suburb of Hillsboro until 11 am. ** Not generally a big deal, but with 50 miles of riding ahead of me, and sunset around 6:30 pm, it meant no time to dilly-dally. But dilly-dally for a moment, because I ran into a whole touring family! They were heading out to the coast and then south from there, with hopes of getting into Los Angeles in five weeks. Mid-October is a bit on the late side for starting a Pacific Coast tour so far north, but they've got scads of good weather ahead. In fact, they lucked out this year, because if they started in September they would have loads of rain. Unfortunately I did not catch their names. I hit the open road and within a couple miles I was in rolling farm country. With the exception of a few wooded areas and towns, this would be the predominant theme of my ride. I had the prelim route all mapped out and cue sheeted, but I also had maps, and I was up for adventure. So I made my first "detour": rather than go around the Chehalem Ridge, I'd go over it. This of course meant a bit of effort, and I felt it as I ground up the hill. And then a moment of bicycle magic happened: an older woman on what looked like a European city bike, loop frame and all, zipped down the hill, shouting "You're going the easier way up!" After much grunting I reached the almost-top of the hill. 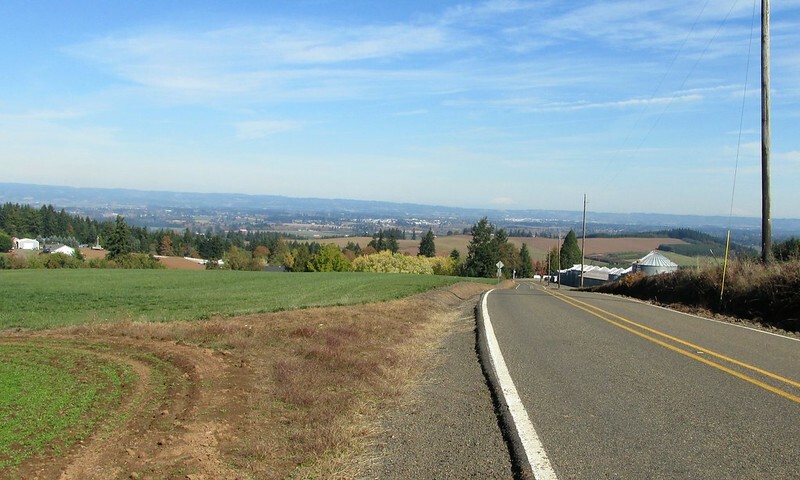 A great view of the Tualatin Valley greeted me, and I made out Mount Rainier, Saint Helens, and Adams. The climbing wasn't exactly done, so some more grunting and sweating, and then I came to the first surprise: about two miles of gravel. I was trying to incorporate some gravel on this ride, so this was nice. And gravel generally means a quieter road, too. 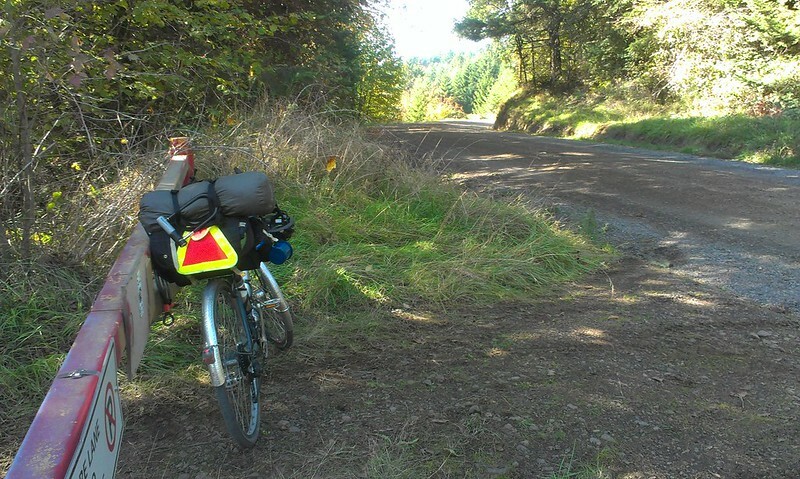 The gravel section passed through Chehalem Ridge Natural Area, where I had a quick snack break. 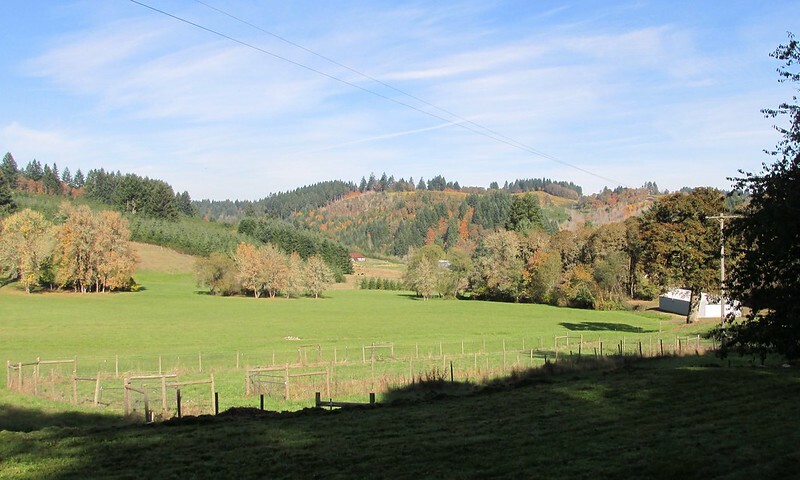 Then a thrilling descent into the Chehalem Valley, which I would follow to the town of Newberg. In Newberg I stopped at Freddies for supplies. 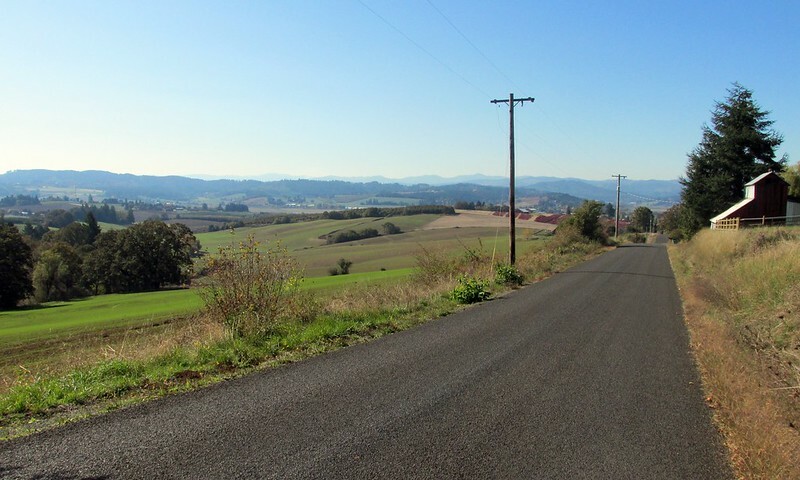 The next 20 miles was along the Willamette Valley floor, which meant that riding would be pretty flat. But the traffic picked up considerably, especially along roads that offered commuters quick access to Interstate 5. (It was rush hour by now.) Things quieted down a bit after I passed through postage-stamp sized Saint Paul, but the riding was nowhere near as good as the first half of the day. I pulled into Willamette Mission at 6 pm, just enough time to set up camp in daylight. The cyclist campsite is off a bike path, and was a modest, but well thought out affair, with garbage can, water spigot, fire pits, four picnic tables, and bike staples. Anyways, I set up camp and made dinner. It was pretty much dark by then, and I spent the rest of the time this evening reading or writing. Or listening to the radio. I typically bring my Eton Scorpion weather band radio with me, but since the forecast was reliably sunny, high 65F, low 40F, there was no need to. **** So instead I brought my shortwave capable radio with me. I can't pick up anything in town, but the clear night and lack of interference meant I finally got something! I listened to Radio Havana Cuba for a bit and surfed through other channels. Most of them seemed to be religious in nature. And I got a bit cold. This is the one big problem with camping this time of year: the days are still warm, but they are short, and there's a lot more dark. A lot more opportunity for the body to cool down. I retired to bed around 10 pm, and thankfully my sleeping bag and pad did a good job of keeping me toasty overnight. Wednesday morn. 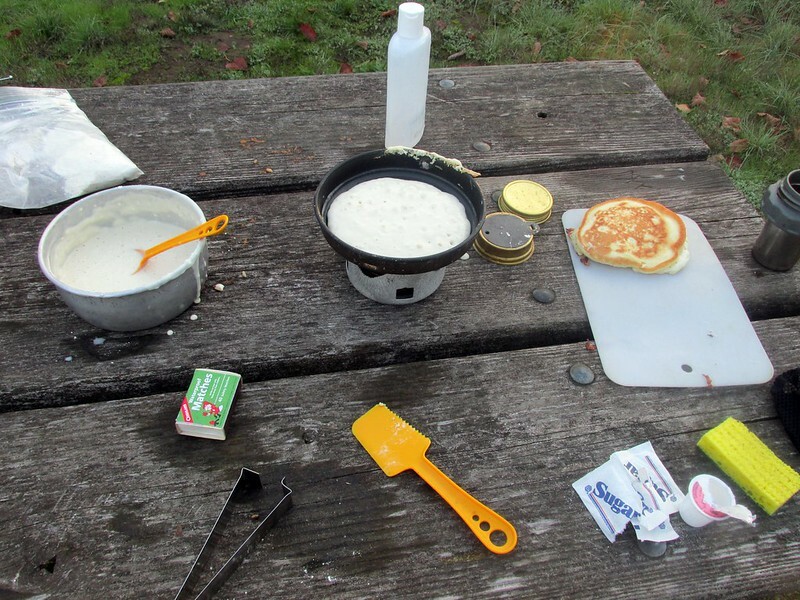 I awoke a little before sunrise (7:30), made a breakfast of pancakes, an packed up. I got on the road a little before 10 am. The first part of the trip involved a special treat: a ferry ride! 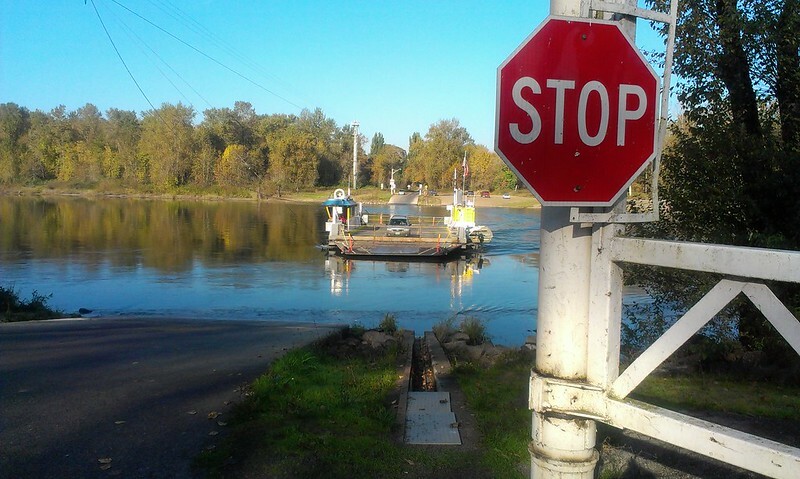 The Willamette River currently has three auto ferry crossings. I've only been on one before, the Canby further downstream, so now I have the Wheatland crossing under my belt. (Next stop: Buena Vista!) The price is one dollar, and before you know it, you're on the other bank. 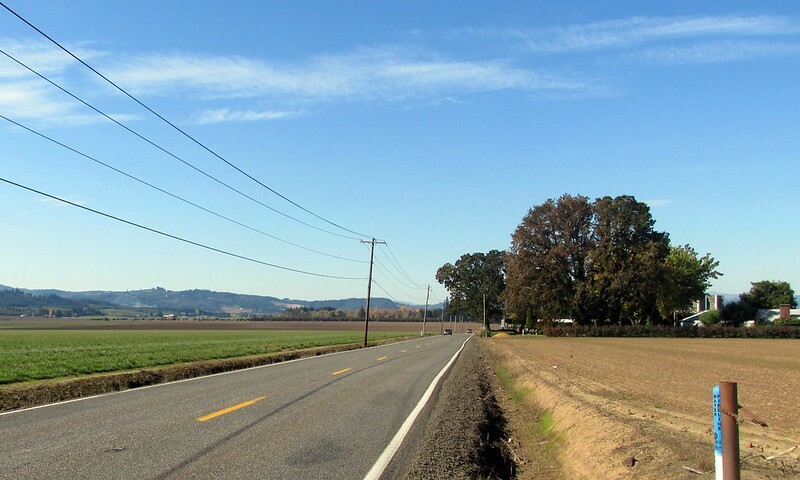 It was about 15 miles of riding through more bucolic Willamette Valley farmlands until I hit the town of Dayton, where I had a quick lunch of Mexican food. Then quickly through Lafayette and I was back in wine country. 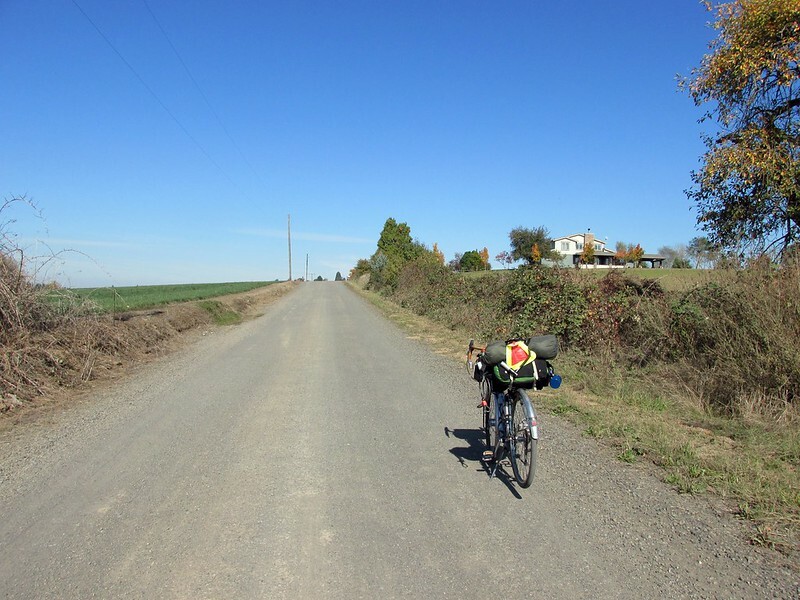 Again, I deviated from the route I drew, and found some rolling terrain and more gravel action between Carlton and Yamhill. 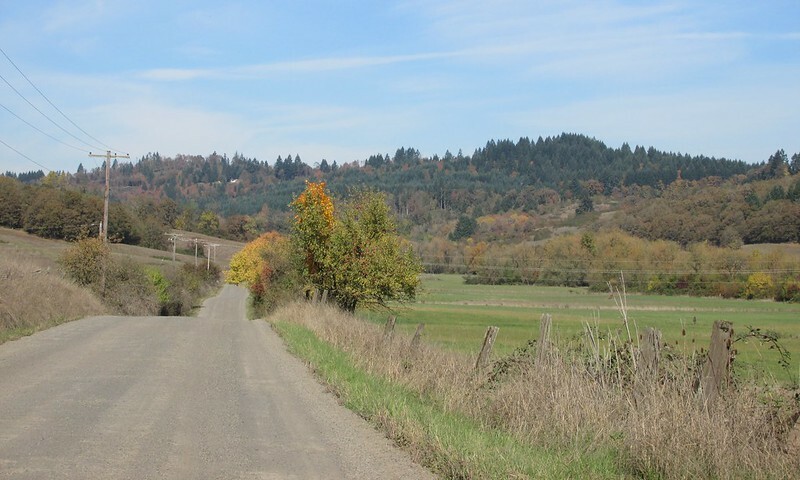 After Yamhill, I decided on a route that went up Bishop-Scott Road. This was another happy surprise, as it offered some nice scenery, and then turned to gravel. There was a good mile or so of good climbing, then I summitted and had a nice descent down Williams Canyon Road. This was probably the best riding of the trip: it was downhill, but a nice steady downhill, it was gravel, but very nice gravel, and it offered some of the nicest views on the trip. The little valley and fall foliage reminded me a lot of home in New England. And soon it was time for the bliss to end. I was back on pavement on Patton Valley Road. The scenery was still good but the traffic picked up. And the bridge was out on old 47, so I was shunted onto new SR 47. It was flat, straight, and had a wide shoulder. And had more traffic than I wanted. 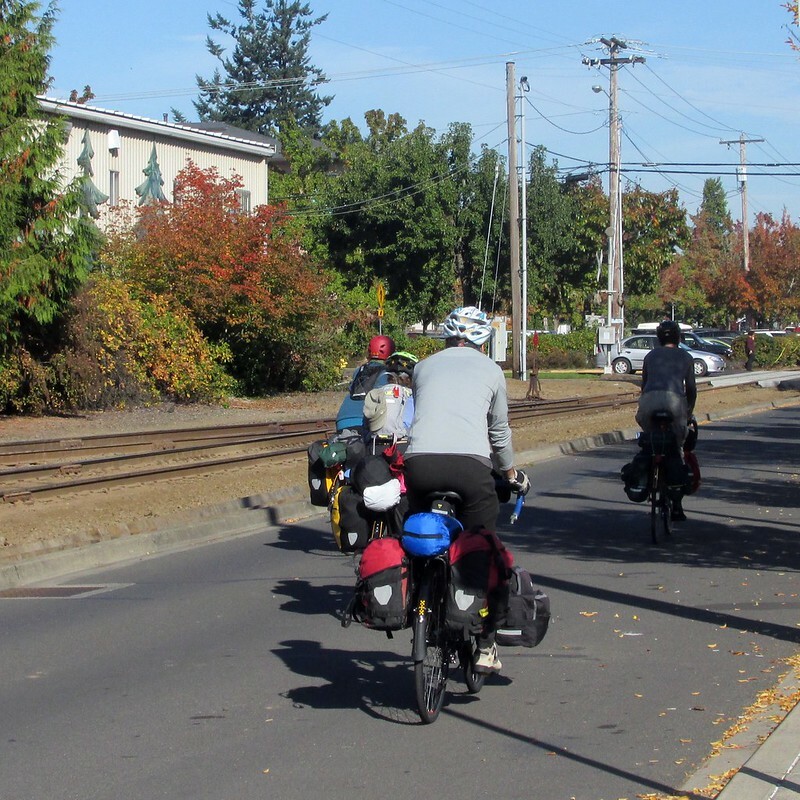 Soon I was in Forest Grove where I stopped at the Grand Lodge for beer and "first dinner". Man, I didn't realize how hungry I was until I started wolfing down all the food! 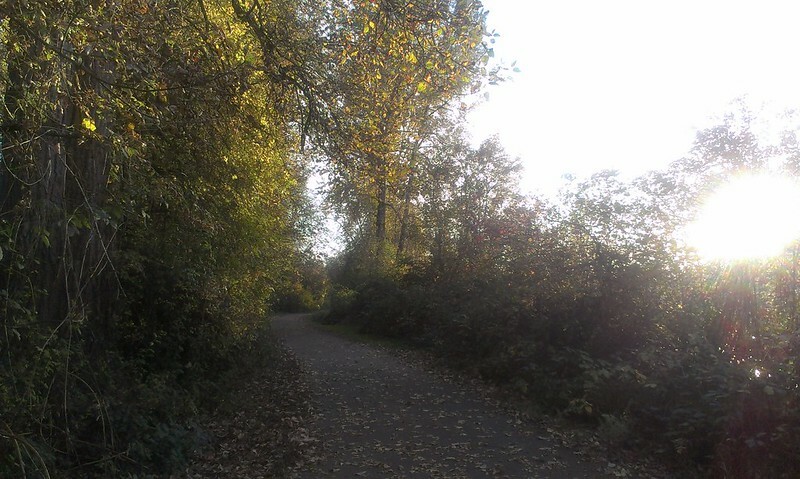 Then about 5 miles on busy, ugly Tualatin Valley Highway back into Hillsboro where I got on the MAX just around sunset. All in all, a great bike overnight. I rode 100 miles on this trip, 50 miles each way. I couldn't ask for better weather in October, and I had great views for much of it and explored new areas. I hope to pull off at least one (if not two) more overnights before the month is over, as long as the weather holds out. *My main beef with the WVSB is the lack of camping. 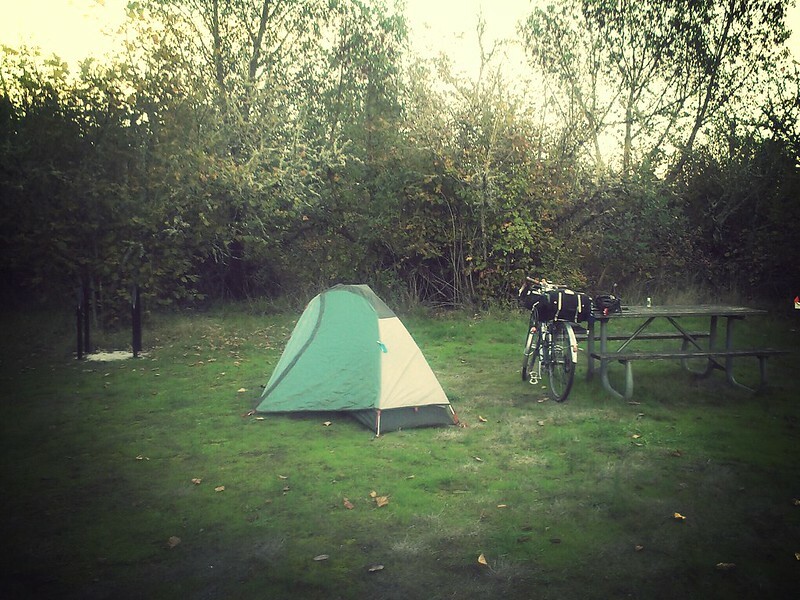 There's camping at Champoeg (the start), Willamette Mission (15 miles in), then nothing until Brownsville at Mile 110. That's a whole lot of distance to cover. 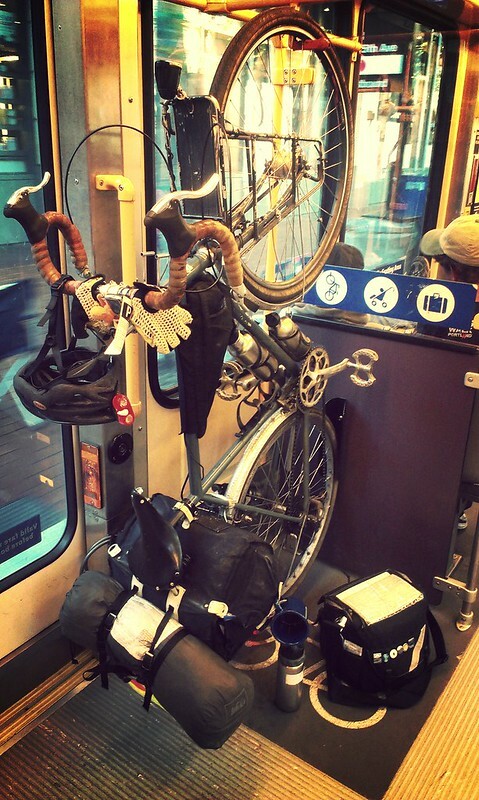 **I took MAX light rail from Portland to Hillsboro. 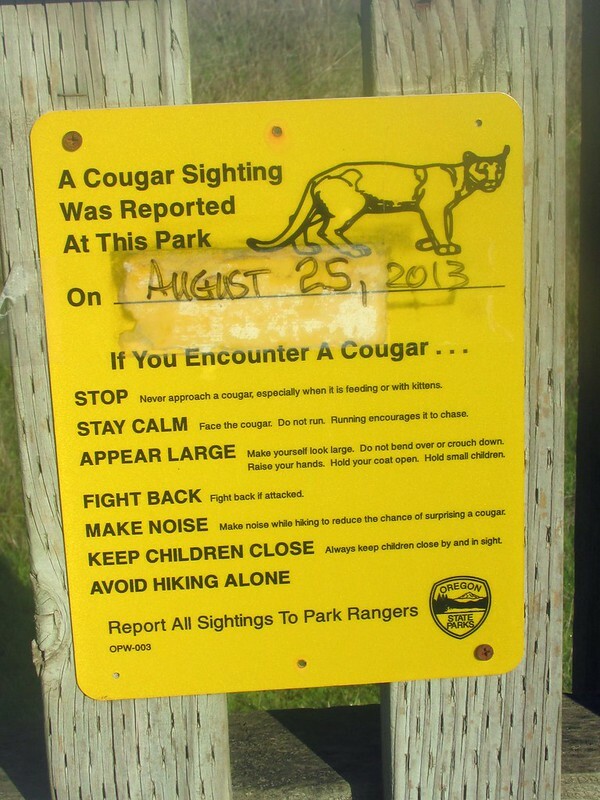 ***As with many Oregon State Parks, there's probably a Camp Host somewhere, but I never saw them. ****And if I really needed to, I could check my smartphone.